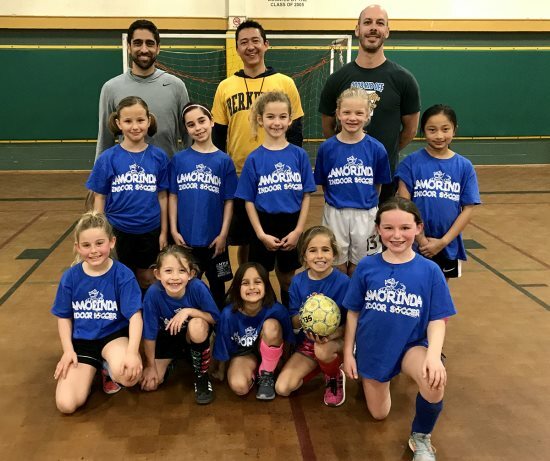 Back row, from left: coach Amit Ahuja, coach Kenji Sytz, coach Kyle Lerch; middle row: Darcy Best, Regan Roy, Casey Lerch, Eloise Britton, Clara Sop; front row: Kelly Reidenbach, Ava Sytz, Leela Cargain, Soraya Ahuja, and Hadley Hastings. Lamorinda Lions beat Richmond Academy 4-1 in the championship game on Sunday, March 17 in Lafayette to claim the Lamorinda Youth Association Indoor Soccer championship for second-grade girls. This team went undefeated this season and has now won four straight league titles.